World Health Organisation has released a statement on the fifth meeting of the IHR Emergency Committee concerning MERS-CoV. Public Health England (PHE) has reaffirmed a commitment to monitoring and studying Middle East Respiratory Syndrome (MERS-CoV) in the UK and globally following today’s World Health Organisation (WHO) announcement. The WHO MERS-Coronavirus Emergency Committee announced today (14 May 2014) that although the conditions for a Public Health Emergency of International Concern have not yet been met, concerns about the current global MERS-CoV situation had ‘significantly increased’. After diagnosing one of the first cases of MERS-CoV in the world at the health protection laboratories in Colindale in September 2012, PHE has continued to be at the forefront of providing public health advice and information on MERS-CoV. PHE lab staff have developed a series of tools for diagnosis and surveillance of MERS virus, giving us the ability to generate genomic sequences and measure antibody responses in response to an emerging infection. These tools are not only deployed in the UK, but can also support international investigations and responses within affected countries. In October 2012 PHE provided virological and epidemiological support to a WHO led mission to Doha, Qatar. We continue to provide virological and diagnostic support to Qatar, most recently in December 2013 when PHE ran a training course to enable Qatari scientists to undertake MERS-CoV testing. The respiratory diseases department and respiratory virus laboratory at PHE prepared a series of advice documents for both the general public and healthcare professionals including risk assessments and advice on how to manage cases. PHE is also working with UK airports on distributing printed materials to alert passengers flying to and from the Middle East about the risks of MERS-CoV and the signs and symptoms. PHE scientists recently met to review the current risk assessment. The updated risk assessment concludes the risk to UK residents and travellers to the Middle East remains very low. No travel restrictions are recommended, however, good general food and hand hygiene measures are recommended. In addition, travellers are advised to avoid contact with camels in the Middle East and to avoid drinking raw camel milk and handling raw camel meat; this advice is particularly important for people with underlying or chronic medical conditions who may be at a greater risk of MERS-CoV. 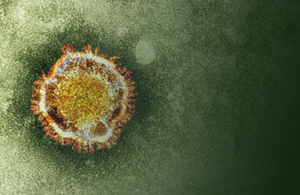 Cases of MERS-CoV continue to be reported from the Middle East. However, no new cases of MERS-CoV have been detected in the UK since February 2013. Although the source of MERS-CoV is currently unknown, there is growing evidence of the possible role of camels in transmitting MERS-CoV to humans. We advise travellers, particularly those with underlying or chronic medical conditions, to avoid contact with camels in the Middle East and practice good hand and respiratory hygiene to reduce the risk of respiratory illnesses. Healthcare professionals are advised to remain vigilant for severe unexplained respiratory illness occurring in anyone who has recently travelled in the Middle East, as well as any unexplained cluster of severe respiratory illness or healthcare worker with unexplained severe respiratory illness. PHE will continue to provide advice on infection control, urgent diagnostic investigation and identification of contacts of suspected cases who may need to be followed up to check on their health. The recent reports of cases in travellers visiting the region and the rise in global cases we’ve seen this month is concerning, and we will continue to monitor the global situation and adjust our risk assessment as appropriate. Middle East Respiratory Syndrome (MERS-CoV) was initially identified in a patient with severe respiratory symptoms in September 2012. Following its emergence, cases have continued to occur, primarily from within Kingdom of Saudi Arabia and the United Arab Emirates. However, cases have been imported to several European countries (France, Germany, Italy, UK, Greece) as well as other parts of the Middle East (Egypt, Jordan, Qatar, Kuwait and Oman) and the rest of the world (Malaysia, Philippines, Tunisia). For more information, visit PHE’s MERS-CoV webpages. The total number of laboratory confirmed cases in the UK remains at 4. There have been 3 deaths, 2 reported in February 2013 and 1 in July 2013. Since April 2014, PHE has been advised of 2 cases of MERS-CoV in passengers flying from Saudi Arabia to the US and transiting through London. The risk of the infection being passed to other passengers on aircraft is extremely low. However, as a precautionary measure, PHE undertook efforts to contact UK passengers who were sitting in the vicinity of the affected passengers to provide health information.